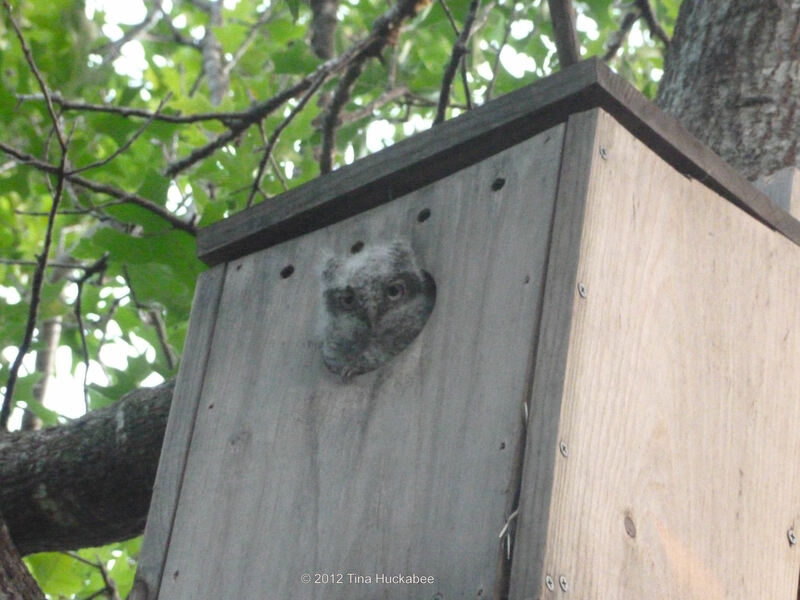 Four years ago on Mother’s Day, my sweet husband and sweet son gave to me an Eastern Screech Owl-house that they jointly made. It’s probably the best gift I’ve ever received. Later that year we put the house about fifteen feet high in a Red Oak tree in our backyard. We’ve had a couple raise three broods in that house (and its replacement, after the house was damaged when we had honeybees removed last year). 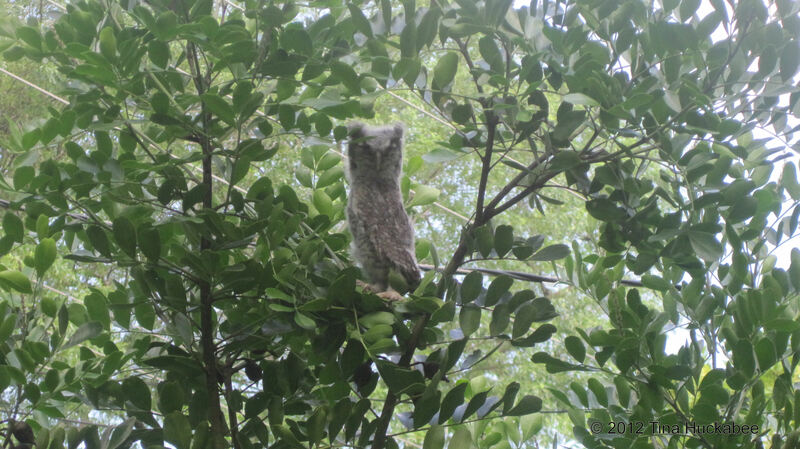 The first year, Mom and Dad raised four owlets and last year, two. This is one of the four owlets from two years ago, just after they left the house. All of them roosted in a Mountain Laurel for a few days. I rescued one from the ground and was awed at the strength and grip of its talons (mice and rats, beware! ), as well as the softness of its feathers. Mom and Dad were cool with my handling their little one, though they kept their big, intelligent eyes on me all the while. This baby is one of the two from last year. And this cutie is one of the parents, alert during the day after its offspring left the house. Each late fall/beginning of winter, I wait with anticipation to hear the male trill to his partner late at night and into the wee hours of the morning, indicating the beginning of courtship and mating rituals. Last year, I was able to witness their canoodling–it’s very quick and sometimes, on the fence. I usually saw them at sundown as they met up after a long, sleepy day. One stayed in the house and the other in a thicket at the back of a neighbor’s property. 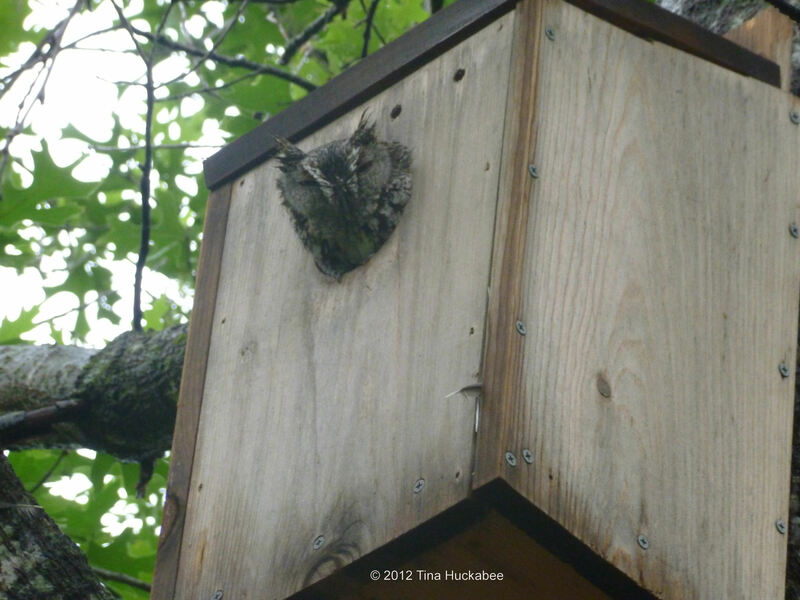 The owls were a little late (and more discreet…) this year in their courtship. I heard Dad’s signature trill of plenty of times in January and February, but only had a few sightings of them until this past month or so. Through most of April, Mom was in the house daily. Mostly, she snoozed and showed concern only when a male squirrel romped too close to her and her brood. She completely ignored the Bluejays who regularly perch on the branches in front of the house and “caw” loudly and obnoxiously at her, offended at the presence of this fierce (though cute!!) predator amongst them. Dad roosts in my neighbor’s thicket. 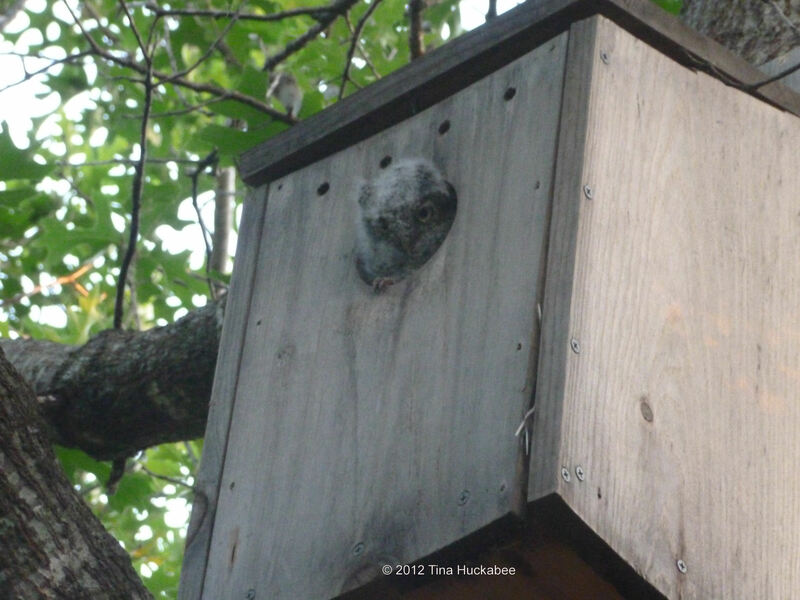 This past week, both parents have flown to the house from the thicket, so things are apparently a little cramped with the growing owlets. Earlier this week, I briefly saw a little bit of fuzzy, grey head before it darted back into the hole. Owlet!! He (maybe she, I have no clue), sat looking out at the big, wide world that he is about to enter, for about 20 minutes. He wasn’t shy at all with the three of us gawking at him. I’m not quite sure how I feel about that, either. From a personal standpoint, I’m thrilled. To be in the presence of these shy, elusive animals is such a gift. But from a biological standpoint, I wish he was a little more skittish about these weird humans talking to him and making kissing sounds. (Okay, it was only me doing the kissing thing.) Maybe he wasn’t particularly nervous because owls (like the rest of us) love being told how darling they are. Now that the owlet(s) are making regular appearances at the hole, it’s a matter of a couple of days before they leave the house for good. They’ll roost in the tree for a few days more, then, they’ll be gone. Hopefully, they’ll have plenty to hunt and avoid cars and the Great Horned Owls that are around. I always mourn a little after they leave. 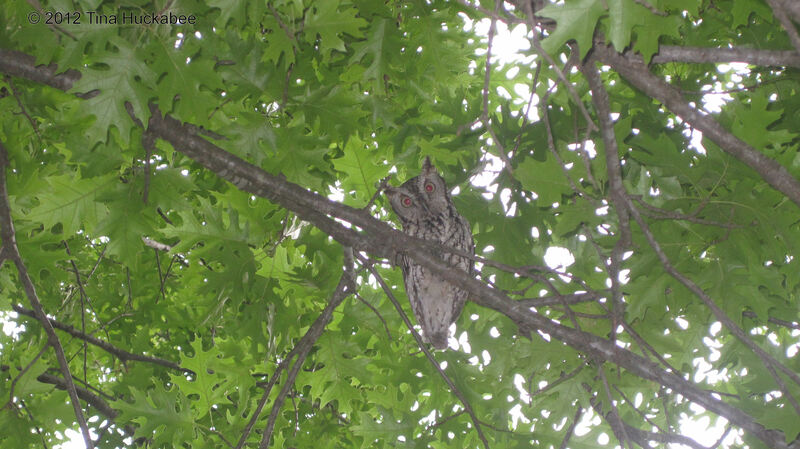 These past two years, I’ve occasionally seen an Eastern Screech Owl in the early summer. But I’ll have to wait until next winter to re-engage an observational relationship with these magnificent birds. Go forth, little owls and live happy, productive owl lives!! 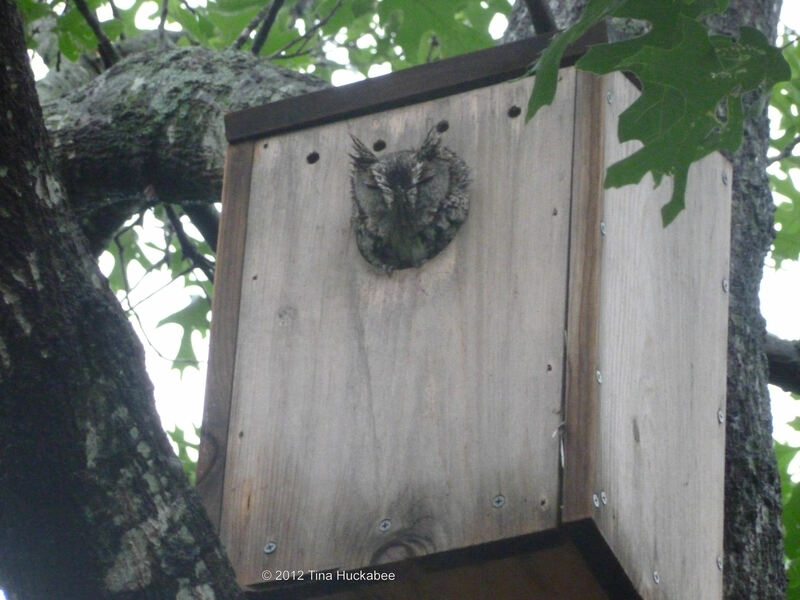 This entry was posted in Eastern Screech Owl House, Eastern Screech Owls by Tina. Bookmark the permalink. That is exciting! I’d be beside myself if I had baby owls in the garden. Okay, if I had ANY owl. They might even be there at night and I don’t know it. Even that is exciting! Love the owls. And an owl house is a very thoughtful and good gift. either was jostled out of the house or leaned too far and fell. Poor little baby and poor parents. I don’t know if there are any others, I’ll just have to watch over the next couple of days. What an excellent blog post, though I’m sorry to read about that adorable little guy’s demise. 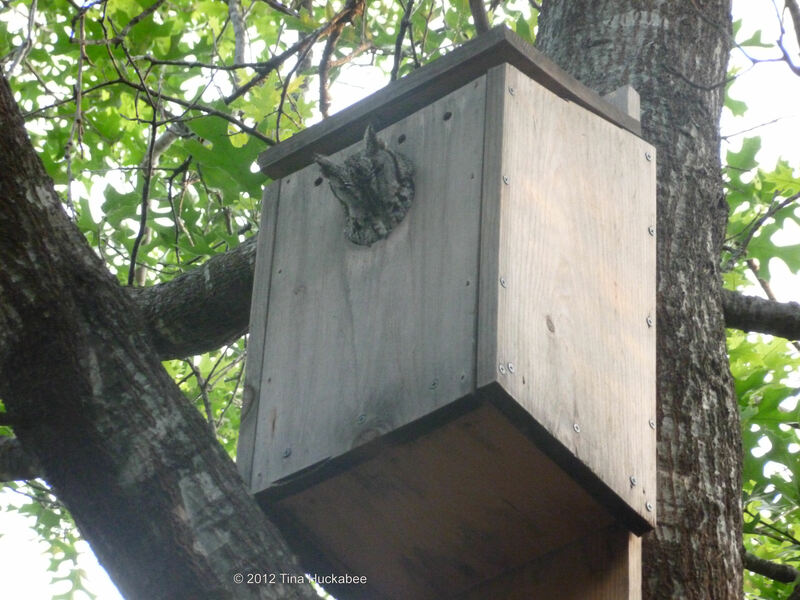 We’ve been so inspired by bloggers posting about their owl box successes that my hubby bought the wood to build us an owl box of our own. I hope to have an own family move in some time in the future. Thank you, Ally. 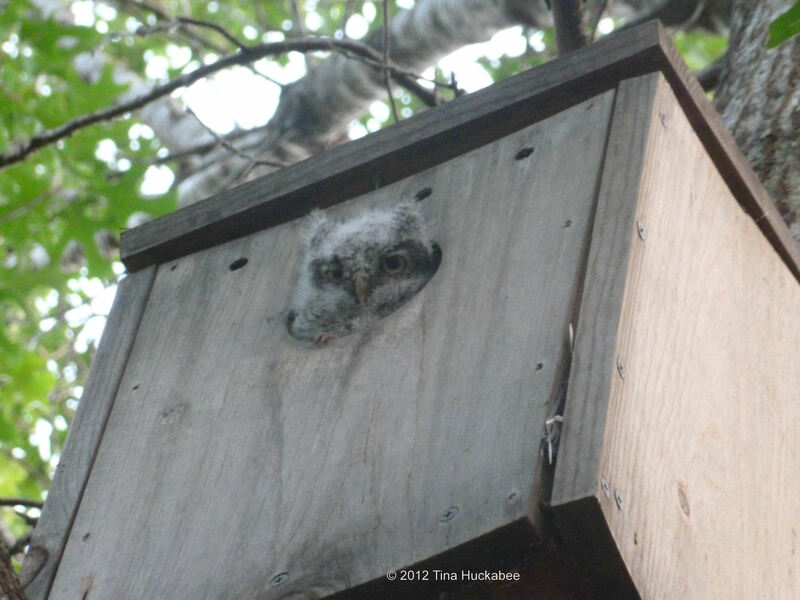 I was sad that one of the owlets died, but it happens–nature/life is tough. I observed the parents feeding another baby the next night or so, but haven’t seen any evidence of a baby since, so I assume he/she ‘flew the coop’. I’m glad your husband will build a box for you–you’ll enjoy the occupants when they come. It’s been such a thrill to host these beautiful birds in my backyard. Best of luck and let us know next year if you have a family of owl of your own. Awwww. I mourn with you the loss of the baby owl. I am quite certain I’d be similarly torn about standing below the box gazing up making kissy faces and telling owlets how adorable they are while simultaneously worrying I was breaking some biological imperative by doing so. I kind of had a hard time not telling the photo owls how cute they are. Out loud. I know that the owls are still around because if I’m out at the right time (sundown and just after), I hear their call. 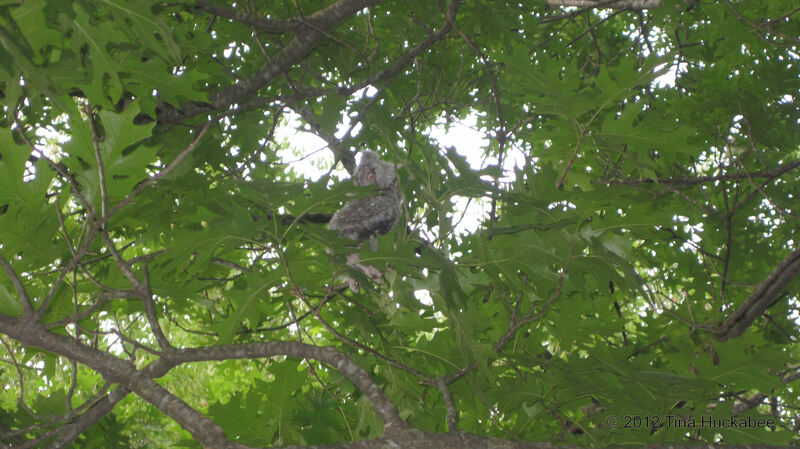 Last night I saw one of the parents fly from a neighbor’s tree to the utility wire and heard his/her call. I’m fairly sure there was at least one baby left and that he/she has now fledged, although is still in the vicinity. That makes me feel a little better. I’m guessing they were dove eggs? We have so many doves around and they have been busy kanoodling lately. The wren eggs are teensy and spotted and these were slightly larger and kind of plain white. There are lots of doves. And sparrows. And grackles. Never enough wrens, warblers or owls. It has been lovely to host these beautiful birds in my garden. They’re gone from the house now, although I’m sure they’re around in the neighborhood. It’s been a banner year for screeches in the bloggers’ gardens. I’m glad so many folks are welcoming these beautiful animals.